What is the only thing in your life that you can truly control? You, right? This negative input, this rubbing you the wrong way, this pinching your last nerves, can be used as a source of learning. Every single situation you encounter has richness in positive and negative potential. It can be a source of tangible or intangible gain, inspiration, enlightenment, learning, growth; or that situation can cause rage, fear, shame, entrapment, resistance. The choice is really not up to the people we’re interacting with but it’s up to each of us as individuals and our willingness to face and work through the situation. You will learn strategies to increase your mental control and make you mentally tougher! Facing conflicts, managing difficult people, maintaining personal control, giving up seeing ones self as a victim or the other person as an enemy, gives you back some control. Don’t fall in to the “victim” trap. The only person who can rescue you from this persecution is you. The other person is rarely an actual enemy, they’re just another human being who has chosen to give you a tough time. It requires giving up your fear of engaging in truly honest communication with somebody else because of distrust, because they’re behaving badly, because of the inputs you’re receiving. By adding new tools to your toolbox you can more skilfully confront the critic, the problem, the difficult situation. You can choose to develop, grow, learn, and become more effective in handling difficulties that you encounter. Again, what’s the only thing you can control? You. You can position yourself to approach and engage the criticism, the conflict, the negative person more constructively. As you do this, here are a few ideas that can help you through this process to both manage the criticizer and the conflict, the negative person and the person who’s trying to push your buttons. One of the things you can do is set the stage for the dialog. In other words, if you’re in their territory, move to a neutral ground. I remember once when negotiating a contract, the other person wanted me to negotiate in his office. His office was like a power symbol. He had his desk, arranged sitting up on a platform. When you were in his office he sat up here on his throne and looked down at you. Your chair was shorter than normal, almost at floor level. So he sat over you, looking down at you like he was your overlord. Would you want to know precisely how to attain goals that are important to you? Instead I said, “Meet me in the cafe below. Let me buy you a cup of coffee while we talk.” So we went to this little restaurant down at the bottom of their office building, and we negotiated down there. I re-set the stage to have this dialog with him on neutral ground because I wanted to level the playing field a bit. Going to a neutral environment can make a big difference. You can also disengage your fight or flight response. You need to clear your mind of things. You already know that this difficult time may be coming but you need to clear your mind, set it aside, and be willing to just have the discussion. You also sometimes need to state very clearly without anger, calmly, what you need in the situation. You need to listen carefully to what’s being expressed by the other person, there’s probably some truth in it or there may be something you can gain by it. So, you need to be able to listen without getting caught up in the drama at the moment. Looking below the surface of what’s being said can help resolve underlying reasons why they’re giving you a hard time. They do that for a few different reasons, we talked about some of the distorters, but you need to make sure you also are getting the accurate message. Do you ever wonder what needs to be done to take your career, athletic performance, physical health, and more to the next level? Are there habits that you just can’t seem to break or that get in your way at times? Have you wondered why some people have such huge success but you’ve never gotten there? 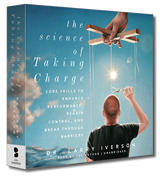 In The Science of Taking Charge you will learn strategies to increase your mental control and make you mentally tougher. You will gain methods for breaking through worry, procrastination, anxiety, frustration and other fear-based emotions. You are about to learn how to supercharge your brain so you can become an ultra-high performer! The only person who can stop you from learning how to achieve what you want is you. It is time to begin taking steps today to enhance your mental toughness so you can laser focus your mind on the goals that are important to you. It’s time to quit wishing and start doing and achieving. No one can change your attitude, increase your skills or mental control—only you can. Where you are today is the result of what you’ve been telling yourself for years about what you can and can’t do. No one can stop you, and only you can start you in the reality you desire. Choose to start now!